I was staying on the edge of Barrio Lastarria, and working in Bellavista. These felt very similar to me to Recoleta or even Palermo in Buenos Aires. However, Ñuñoa felt like a totally different city. 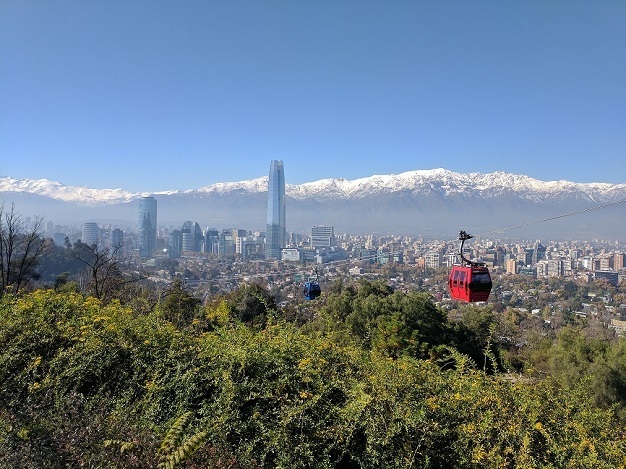 And Las Condes was practically upscale compared to the rest (apparently it’s loosely known as “Sanhattan” but I think that’s a stretch). The metro between most of these places was quite easy too, given how short it was. I made the mistake of finding a place near the previous RY accomodations, while the current group was actually staying in Bellas Artes, which was almost a 20 minute walk. It’s a shame there aren’t better tours and walking tours of the city, as every area had a different feel, but it was also tricky as an outsider to figure out what that local feeling was. Maybe my Spanish has improved, or maybe the Chilean Peso is devalued so much that I was hearing bigger prices than ever, but I swear this is the first time I heard someone say quinientos for five hundred. I also read that they do use the voseo, but I never heard it in my interactions with locals; I suppose it’s possible I heard a verb conjugated with the voseo conjugation, but using the tuteo pronouns, but I probably wouldn’t have noticed that either. I did hear a slightly difference accent, but I didn’t specifically notice other features I’ve read are common, like interdental fricatives replaced by glottal stops in certain sounds.